Norwich City’s Player of the Season Award has rarely been a tight contest. In recent seasons, James Maddison and Bradley Johnson had it wrapped up by mid-December, Wes Hoolahan and Jonny Howson unsurprisingly won amid weak competition, and Robert Snodgrass battled off a strong late challenge from Carlo Nash to rightly scoop the prize. Even between 2009 and 2012, when Paul Lambert led a team, worth far more than the sum of its parts, to two promotions and Premier League survival, Grant Holt was our player of the season in all three years – likely by a landslide. Of course, the winner won’t be quite so obvious this year. Several fans have even suggested giving the award to the whole team but, with any luck, every player will have a medal around their neck by the season’s end anyway. What’s that saying about a rich man having less chance of entering heaven than a camel does passing through the eye of a needle? If Buendia was slipping the camel through to Teemu Pukki on the edge of the box, no needle could stop him. And Norwich would’ve scored, again. I have to keep telling myself, and anyone that doesn’t support Norwich, that Buendia is only 22. He already looks like the complete footballer for this level; his first touch, passing range, deftness of movement, defensive work rate – and now his ferocious shot – all add up to form a future Champions League player. Buendia has nine assists and seven goals this season but that isn’t a fair reflection on his importance to the team. The Argentine is integral to everything City do offensively, which is probably why we’re yet to win a game he hasn’t started, with two exceptions – Forest away, for which he came on and assisted the winning goal, and Preston at home, when he came on with the game scoreless. 24 Championship goals with eight games to go would win Pukki the Barry Butler Trophy in any normal year – Grant Holt scored just 21 league goals when winning in 2011. Besides, the Finnish GOAT has as many assists – nine – as the plucky Argentine trying to steal what is rightfully his on stats alone. It’s not Pukki’s stats that have most impressed me this season, though. It’s the fact that he takes to the field seemingly with a protractor and compass to hand. Take his goal at home to Sheffield United as the prime example. With his back to goal, Pukki takes three (yes, three) looks behind him before receiving the ball, then strikes it on the turn, deliberately looping it over the onrushing defenders and into the only part of the goal the ‘keeper can’t reach. How about his first goal at Bolton, too? He knew he wasn’t going to score immediately from such a tight angle, so pulls the ball back to take the defender out of the equation and strikes the ball from a much better position. His two goals against Ipswich: For the first, Pukki has the precision of Ronnie O’Sullivan, chasing after the ball while calculating, in barely a second, the exact angle needed to score. For his second, the Finnish Terminator quickly calculates that he can’t go through Bartozs Bialkowski, and he certainly can’t go over or round him – so he’ll have to slide the ball under him. Watch any Teemu Pukki goal this season and you’ll notice his mind working in overdrive to figure out exactly what needs to happen for the ball to end up in the net. He’s a mathematician on a football pitch and a worthy winner. Have Norwich City had a better full-back pairing in the last 20 years? Adam Drury’s partnership with Marc Edworthy runs it close, but Aarons and Lewis will move on to greater things than either (and Norwich fans know how underrated Drury was, considering he was often left by Darren Huckerby to defend an entire side of the pitch by himself). Lewis, 21, and Aarons, 19, have started a combined 67 games this season (34 for Lewis and 33 for Aarons) and their meteoric rise to prominence could not have been better timed. Norwich may have reinforced their full-back reserves had the two lads from Luton never emerged but take a moment and imagine where City would be in the table with Ivo Pinto and James Husband as starting regulars – that’s how much of a difference the Championship’s best full-backs have made. Aarons, in particular, is a serious contender. Here’s one for you: would Norwich be better off right now with James Maddison playing behind the striker, rather than Stiepermann? It’s testament to the German that the question is even being asked, considering Maddison has created more goal-scoring chances this season than any other player in Europe’s top five leagues. And yet, how much more could Maddison, last season’s player of the year, have realistically done? He may have scored more, but Stiepermann’s value to the team comes from the telepathic connection he has with the players around him – not just in terms of their link-up play but the way they press so effectively as a unit. Stiepermann regularly wins the ball back high up the pitch and it is this, as much as his attacking quality, which makes him so valuable. Christoph Zimmermann was playing in the German fourth division two years ago. Today, he captains the team top of the English second tier while marshalling a defence that, without Zimmermann, is just 20.3 years old on average. I’m 25 and can’t even draw a straight defensive line – imagine the leadership qualities required to take two 21-year-olds and a 19-year-old to the top of the Championship. I hope Zimm and Tim Krul at least get a thank-you in the Ballon D’Or acceptance speeches of those three – they’re the most unsung of heroes, both of them. Ironic for a player who has one of the worst long shots I’ve ever seen (this was written before the ‘Boro game…) but Hernandez’s efforts have slipped under the radar a bit this season. The Cuban is oddly consistent for a winger. Onel always tries to stamp his authority on a game, and his speed and physicality are always noticeably absent when he’s not playing. He’s popped up with crucial goals too – his two at Birmingham, two against Forest and the opener in the Derby are five of the most morale-boosting goals Norwich have scored this season. His strike on Teeside will be one of the most important too. Every player deserves some sort of mention, but the most honourable of mentions go to Timm Klose, Mario Vrancic and Mo Leitner who, were it not for injury, would all be big contenders (Leitner in particular, in my opinion). Do leave a comment if I’ve missed someone you think should win it! My choice lies within your “dark horses” category and to give you a clue he doesn’t play behind the striker. The only name I would add is Ben Godfrey to said “dark horses” category. A great read Jack and an excellent summary of the top contenders. 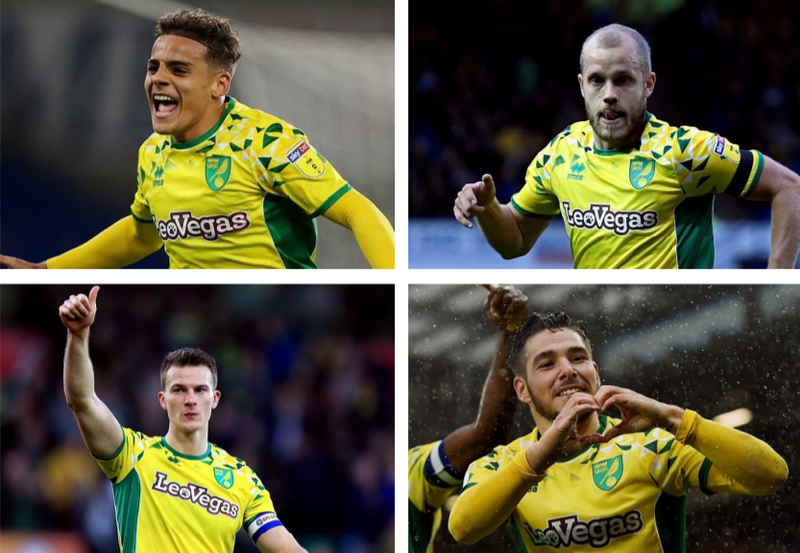 I’ve really only been following the Canaries for the last 20 years or so, but I can’t remember us being blessed with so many potential winners and you’re not the first to suggest it should be given to the team, but as you rightly say, they should all be wearing a medal at the end of the season. Barring a cataclysmic implosion by ourselves and the 2 Yorkshire ‘Terriers’ dropping no more than a few points over the remaining 7 games, when they both have to play Birmingham and Preston in their next 2 games, I’m quietly confident that we’ll have promotion confirmed over the Easter weekend!!! I read somewhere earlier that we are now 66/1 on for promotion and even 5/1 on to go up as Champions. Quite a difference when you could get odds of 8/1 for promotion back in October!!! I opted to give up my Season Ticket last season, but saw enough promise towards the end of last season to get one for this season and boy, am I glad I did. I’ve heard of several who gave up their STs after last season and are now SERIOUSLY regretting it. Now, WHO should I vote for?????? I think your article answers the question Jack. All would be worthy winners in any other year but this year is special. It would go against the ethos of the whole system which has produced this wonderful team to nominate one individual. I would suggest therefore, that an exceptional team requires an exception to the norm and award the trophy to the entire squad. But the award is for ‘Player of the season’. Make the distinction this year and when do you stop? Under Farke I can see it being very much an exceptional team effort next season too, do you then do it again? You will only damage moral by picking out one individual, which is more or less impossible this year. I’m happy for it to be awarded to the team next year if it’s as good as this one. And then it is no longer player of the season! Could it also make a rod for our backs, first season you then award it to one player, was that team not as worthy as those before? I realise it has been very much a fantastic team effort but this sort of lets not pick anyone out nannystateism is silly, by definition it is a singular award. I guess the question is whether we see this season as a normal one but without an obvious POTS, or as a truly exceptional one. I’m inclined to the second view. Bristol City had no problem, as I understand it, going back to their traditional POTS after a team award when they had a season equivalent to ours. As to the future: if we made a team award this time, I suspect future fans would look back and say “wow, that must have a special season to be part of”. And they’d be right. All the options tell me that it should be a squad award. The magic intangible squad togetherness has been the key this season. Now Barry Butler was never intangible, so it has to go to the embodiment of the concept: THE SQUAD. It speaks volumes about how good we have been that so far in the article and two posts so far we haven’t even had mention of Tettey or Trybull. Both have been magnificent and invaluable in their contributions to the season. Like Leitner who I also think very probably could have gone on to win had he not got injured. Trybull had he played as many games as the chief protagonists in the vote, I think would be right up there too. For me it’s still Pukki, even though he has hit a slight lean spell, he still works his socks off and provides. His goals, assists and alround workrate have been so important. With that said Buendia, Zimmermann and Arrons for me are pushing him all the way and if the goal drought goes on then maybe he could be pipped. I agree with you General that after the first couple of months Leitner would probably have featured top of my list. He was instrumental in making our passing game so much more incisive, by increasing both the tempo and the forward movement. With him out since the new year though, an all season round contender moves onto those listed here by Jack. Pukki has been brilliant no doubt, and it’s his work rate and assists that count too, But, for me, other players come into the picture too. Pukki has been able to score because of what is happening behind him. Last season we were rudderless and leaderless too, and we didn’t have the toughness when we needed it. This year we seem capable of weathering all manner of situations, in terms of what is thrown at us both by our opponents and the weather. I’m also increasingly inclined towards our dark horse leader at the back. How he has stepped up and grown. I first entered Carrow Rd in 1961/62 season, never been so spoilt for choice as to who to vote for, since the trophy has been running. I settle on one, and then another pops up and so on. I could give it to Naismith for getting out of the club, along with Wildscut or Husband . Back to the serious side. I was at first agaisnt a team award, but the more I think it would be the fairest all round, but cannot see that happening. We all have favourites the diversity of supporters will come up with a winner. I would add that if one player wins, it isn’t a bad reflection on any of the others. How about a partial solution to the ‘individual or team’ conundrum by awarding the trophy to one and striking a ‘Barry Butler Medal’ for all the others in recognition of their team contribution? Thought-provoking stuff, Jack – thanks. Like JohnF and Nick, I’d argue that a team award would be appropriate for this special season. In similar circumstances Bristol City suspended the individual award for a year; everyone seems to have been happy with the outcome, and there was no problem reverting to the traditional system afterwards. Setting that aside, if we stick to the individual award it’s a very tough choice. Buendia is a special player who’s punctuated the season with wonderful moments. But “the complete player”? I didn’t think so when he gave away two unnecessary penalties, and I’m not ecstatic when he lets play go on while he complains about decisions. For me it would come down to three. Even with the goals drying up a bit, Pukki’s workrate and intelligent running are vital to the functioning of the team. Max Aarons is simply the most effective 18-19 year old full-back I can remember – absolutely fearless, as good going forward as defending. And Christoph Zimmermann – well, just to say he deserves everything that’s been written about his play and leadership. I could rave about several others. Just a shame – and I suspect the players might agree – for only one to be singled out. I concur with you, John F and Nick. But it would have to be a one-off as a statement on what has been a VERY special season with such a collective effort and I would go so far as to say it should be a SQUAD award..
Maybe that option could be added to the “official form” in some way? I’d go with that myself but if others wish to single out individuals that’s totally fine by me – I like to see true democracy in action – all too rare these days. If remains individuals only my vote would be Zimbo even if only in praise of how far that lad has come since joining us. I too agree the players would accept – and most probably actively enjoy – the receipt of a group award. The egos are not present in this squad to object to it. It’s as close as it possibly could be, but I’d give it to Pukki. All the bases well covered. I particularly like the thought of Emi Buendia threading a camel through the eye of a needle to Teemu lurking on the edge of the box. I’m pretty sure the Finn would with some part of his anatomy find a way of depositing the beast into the net. JohnF makes a good case for the award being shared amongst the entire squad. If they pull this off in the next few weeks I can see Carrow Road hosting an impromptu party until midnight come the last home game of the season such will be the outpouring of love. Great column Jack, and very thought provoking. I’d previously gone along with giving it to the team, but it is, after all, PLAYER ofthe season, and there are just so many options. With that in mind, I think my vote has to go to Pukki, not only because of his goals, but also his assists and all round game. Buendia would have won it for me, if it hadn’t been for the two penalties conceded, and honourable mentions for Aarons, Lewis, Steipermann and Zimmermann. Hernandez and Godfrey definitely come into the dark-horse category, and Leitner, Trybull, Klose, Rhodes and Vrancic would surely be there or thereabouts if they had managed more appearances. Maybe it’s so close and these are such a special group that we should give it to the team – now, where have I heard that before?? I would go for the Argos dark horse in Onel Hernandez he has now added Hemsby slots to his likes he really knows how to have a great time. There are so many candidates this year I don’t think there will be an overwhelming vote for anyone and it will be extremely close. The squad this year has been punching above its own weight, so to pick just one name is always going to be difficult. Most people have rightly said that without Teemu’s goals we would not be where we are now. Having said that without the right pass, he would not have scored as many, thus the delemer! I personally think that like the Grant Holt days, we need the front line to get the majority of goals, so in my option it comes down to choice of two. Teemu and Emi. The choice is very close. The team award will be The Championship trophy, which they will all have contributed to and will thoroughly deserve. For me, it’s a choice between Teemu and Christophe. But with 7 games still to go, it’s too early to make that choice. These awards should be decided when the season is either over, or just before, when all the final positions are known. It is ludicrous, for example, that the EFL have already decided that Colin Wilder should be Manager of the Year. They may not even get promoted!! I think the players will get plenty of glory and deserved accolades. I would say give it to the recruitment team en masse. However, I imagine their anonymity is an advantage when looking at the next Emi (especially if they’re looking at Derby or Leeds players through the bracken). I have no real view on who should have it-perhaps it’s time to show some love to the only player to have played every minute of every game? Yep… Teemu Pukki baby for me too. Minus his goals, all of our beautifully intricate football would likely not have propelled us to the summit. But without big Christoph marshalling the back four……..
And then there’s Emi. And Onel. And Tom and Max and Ben and Jamal…… I could go on. What a diverse choice we have! However, the one thing that stood out for me during Grant Holt’s era was his leadership – which contributed in no small part to his winning the award. This year we have 2 leaders who have helped the the back line and in particular the youngsters. Many people are plumping for Zimbo and he would be a worthy choice given his bravery and leadership. However, my vote would go to Tim Krul who, as the “father” figure, gives confidence to those in front of him and in particular helps the 3 youngsters in the back line. I also wouldn’t be surprised if he runs the dressing room. Sorry for the left field vote – but I think his total contribution largely goes under the radar. Emiliano Buendia, a complete player and the best in the Championship. Emi for me, has been a class above and single handedly won us more than a few tight games. If you’d asked me at Christmas I’d have told you Moritz Leitner was the best player in the league. Testament to the squad especially McClean that he has barely kicked a ball since then. I agree with Emi. Leitner’s loss of the award is also testament to the thugs at Blackburn who kicked him out of the match and effectively out for most of the rest of the season. People keep saying that we are going to hammer someone. I truly hope it’s them. If all the players have played to their best, then the award must go to the man whose job it is to encourage and inspire those players. The captain.